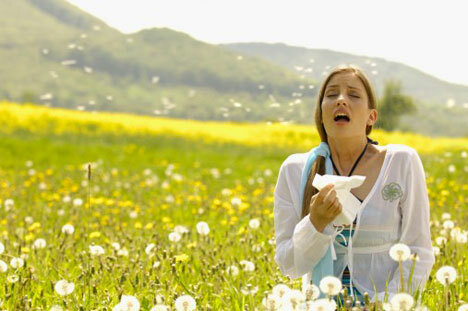 Spring is here and so is the beginning of seasonal allergy symptoms. Most seasonal allergies are caused by airborne pollens. This comes in the form of a very fine powder that is released by trees, grasses and weeds. Molds being airborne in outdoor air also contribute to seasonal allergies. An allergy is an immune system over-reaction that causes the body to have a hypersensitive reaction to a normally benign substance. An allergy test is needed to determine which allergens are causing the problems. In warmer parts of the country outdoor allergens may be present year-round. For the rest of us, it normally begins in late winter or early spring and continues through late summer or early fall, depending on the climate. As the season progresses, varied pollens are present to trigger allergic reactions. Ragweed is the number one cause of seasonal allergy symptoms. Allergic rhinitis can develop into other complications. These complications may include ear infections, sinusitis, recurrent sore throats, cough, headaches, and it can trigger allergy asthma attacks. This is why it is important that the allergy symptoms be well controlled. Increasing amounts of ragweed pollen can trigger serious allergic asthma symptoms such as wheezing and difficulty breathing. Children who are allergic to ragweed are especially at risk of developing asthma during peak pollen season. A three-year study of children with seasonal allergies found that one in five experienced asthma symptoms during pollen season despite no previously reported history of asthma. Researchers at the National Institutes of Health (NIH) have found that more than 50 percent of current asthma cases can be attributed to allergies. Of these, approximately 30 percent are attributed to cat allergy. Asthma in the U.S. is one of the most common illnesses and affects more than 22 million people. Outdoor molds usually reach their highest levels in late summer or early fall. Some regions such as Florida can have high outdoor mold counts throughout the year. It sounds overwhelming, but you are not powerless against seasonal allergies. There are traditional and natural allergy treatments that can provide relief of allergy symptoms. Traditional allergy treatment means taking over-the-counter antihistamines such as Claritin or Zyrtec. You may opt to get a series of immunizations after your allergist tests you for specific allergy reactions. These immunizations, or allergy immunotherapy, usually are given over a period of years, but many people do find some eventual relief of respiratory allergies to pollen, dust mite allergy, and outdoor molds after completing the series. Nasal sprays, another traditional allergy treatment, can reduce or block seasonal allergy symptoms. They help reduce inflammation and counteract the allergic response. Non-traditional or natural methods of coping with seasonal allergies are varied. Research studies have found some of these natural allergy relief treatments to be as effective as prescription and over-the-counter drug remedies but without the side effects usually experienced such as fatigue, grogginess, drowsiness, etc. They are for the most part cheaper. They also provide relief without having to be dependent on an artificial chemical(s) for those who dislike taking drugs of any kind. Quercetin, an antioxidant, belongs to a class of water-soluable plant substances called flavonoids. It has yet to be proven by research that it is effective against hay fever. However, it is thought to prevent the release of the inflammatory chemical histamine from immune cells called mast cells. Sneezing and itching involve histamines. Quercetin can be found in certain foods such as apples (with the skin on), berries, red grapes, red onions, capers and black tea. It is also available as a diet supplement. The typical dose for hay fever is between 200 and 400 milligrams three times a day. Carotenoids are a family of plant pigments. The most popular of these is beta-carotene. No controlled studies show that carotenoids are effective against hay fever, but a lack of them in the diet is thought to promote inflammation of the airways. There are no guidelines to suggest a recommended daily intake against hay fever. But many people don’t eat even one serving of carotenoid-rich foods a day. Those with seasonal allergies should try to digest at least two servings per day. Research suggests that omega-3 fatty acids may reduce the production of inflammatory chemicals in the body. One German study involving 568 people found that a high content of omega-3 fatty acids in the diet was associated with decreased risk of hay fever. Good sources of omega-3 fatty acids are fish oil capsules, flaxseed oil (1 tablespoon two to three times a day) and walnuts (1 ounce or 14 halves a day). Mangosteen, a tropical fruit, (see article on this website) is in a powerful class of antioxidants called Xanthones that have proven to be a great source of natural allergy relief. Mangosteen juice is available at health food stores. Seasonal allergies can be debilitating, but today there are a host of effective treatments that will not cure them, but greatly reduce their symptoms. . It’s up to you as to whether you want to go with traditional therapies, alternative/natural treatments, or a combination of the two.